Breathtaking views of the Mediterranean in a peaceful setting. Villa Tsambika View will invite you to relax and unwind enjoying the view and taking refreshing dips in the private pool. Three air-conditioned bedrooms and three bathrooms will accommodate a family, a group of friends or honeymooners wanting to get away from it all. A spacious, open plan living area and kitchen offers a high level of comfort and convenience and that all important brick built BBQ will allow you to continue enjoying the weather whilst you cater. Cushioned sunbeds and wide umbrellas around the pool offer sun worshippers a perfect spot to top up the tan whilst a cool drink can be enjoyed under the shady pergola. Outdoors: Cool off in 9 metres by 7 metres pool whilst enjoying the sounds of the countryside and the occasional wild goat. Cushioned sun-loungers and umbrellas allow you to relax around the pool in comfort and the shady pergola on the patio will give you a cooler moment to contemplate your next swim or choose a new book. A brick built BBQ will allow you to cater for your needs whilst not losing any outdoor moments. Local area information: Tsambika Beach, just 3.5 km away, is one of the best beaches on the island as it is sandy, has calm waters and is quite shallow for around 100 meters. There is a good choice of water sports and beach tavernas. Kolymbia resort is 6 km away offering sandy beaches, water sports, tavernas and cafés. The refreshing streams of the seven springs are just a 15 minute car ride away. Enjoy a meal watching the ducks after walking through the Italian tunnel. The 18-hole golf course in Afandou is 11 km away and Europe’s largest waterpark in Faliraki is 18 km away. 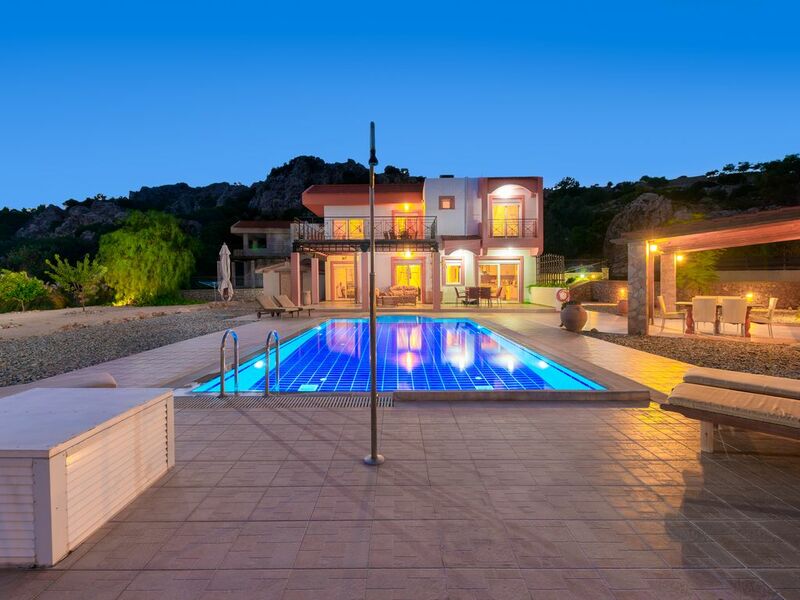 Cool off in 9 metres by 7 metres pool whilst enjoying the sounds of the countryside and the occasional wild goat. Cushioned sun loungers and umbrellas allow you to relax around the pool in comfort and the shady pergola on the patio will give you a cooler moment to contemplate your next swim or choose a new book. A brick built BBQ will allow you to cater for your needs whilst not losing any outdoor moments. Villa Tsambika View boasts breath taking panoramic views of the historic and locally famous Tsambika Monastery. It is situated just a 5 minute drive away from the golden sandy beach and crystal clear blue waters of Tsambika Beach...easily one of the best on the Island. Villa Tsambika view offers the perfect balance to its guests, either enjoy the private pool and soak up the sun at the villa or hire a car and explore the Island. Visit the medieval old town of Rhodes or the cobbled streets of Lindos. Golf: Afandou Golf Course: One 18-hole, par-73, golf course (6800 yards), designed by Britain's world famous golf course architect, Donald Harradine. Since May 1973 the 18 holes have been made available to golfers. The course's tactical features are a challenge to good scoring, both for amateurs and professionals. The trees, fairways, and greens are laid with different grasses selected to keep the course green throughout the year. The Golf Club is open all the year round. Admission fees are nominal and caddies, caddy carts, golf clubs and balls, as well as instructions, are available at moderate hire charges. Rates are subject to change until booking is confirmed. The rates advertised are inclusive of linen, towels and pool towels.